On Tuesday, September 11th, during the company’s business meeting, the Testa family was on hand for a special dedication. 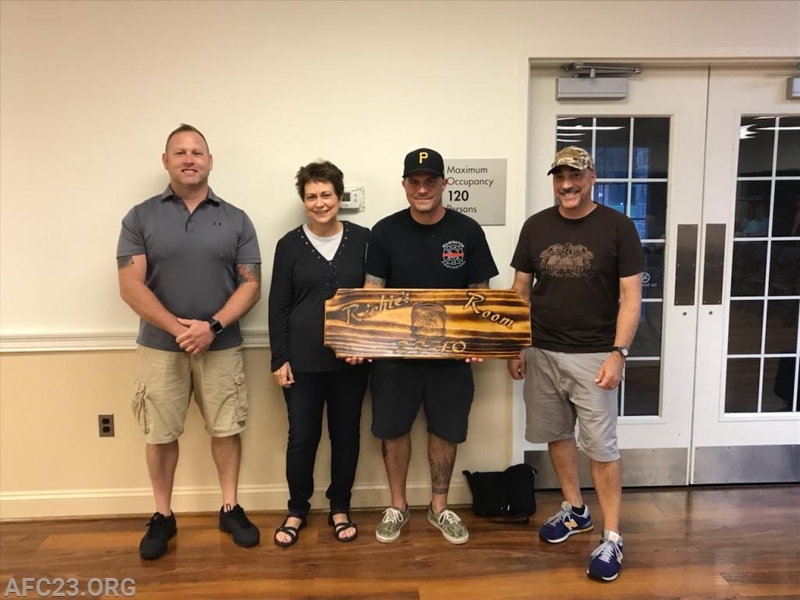 Tom Shoemaker, owner of "Your Rustic Freedom" was on hand to present a hand carved plaque to the Testa family and the members of the Avondale Fire Company in memory of Chief Engineer Richard J Testa. Life members Linda Testa (Richie's Wife), Paul Testa, and Augie Testa (Richie's Sons) received the plaque from Tom. The plaque will be mounted on the door to the engineers’ room, or as the members call it "Richie's Room." The unofficial room name has been used by members when referring to the room since moving in and is where Richie organized the company’s tools and parts for the apparatus. The room will now be forever known officially as "Richie's Room" in his memory. A special thanks to Tom for his beautiful work! !